It's almost the weekend! What do you have planned? The weather here in Sydney is set to be sunny - I just love winter! On days like this I love spending time outdoors, going for long walks, taking photos and just admiring the beautiful views. I usually spend some time working on projects I have going on as well - crafty things, props and so on. Needless to say I love visiting markets on Saturday mornings too. 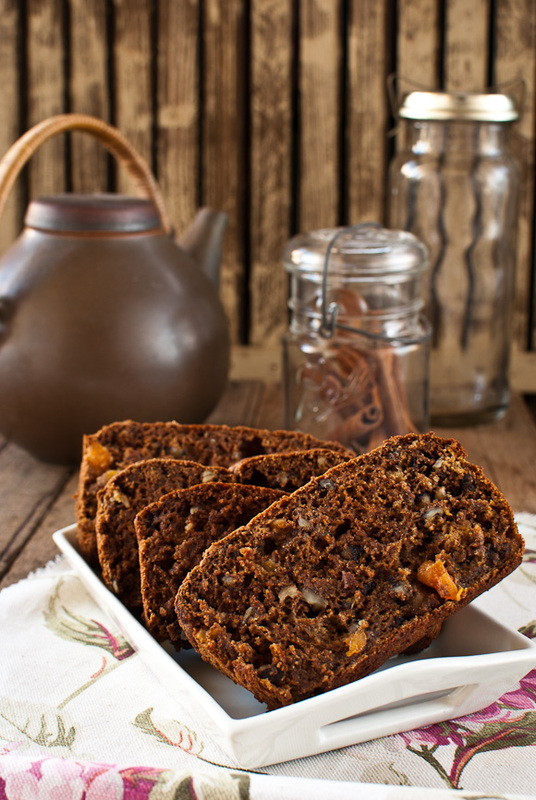 I also love to bake a little treat for the weekend afternoon tea, and this persimmon and walnut bread is a real treat! 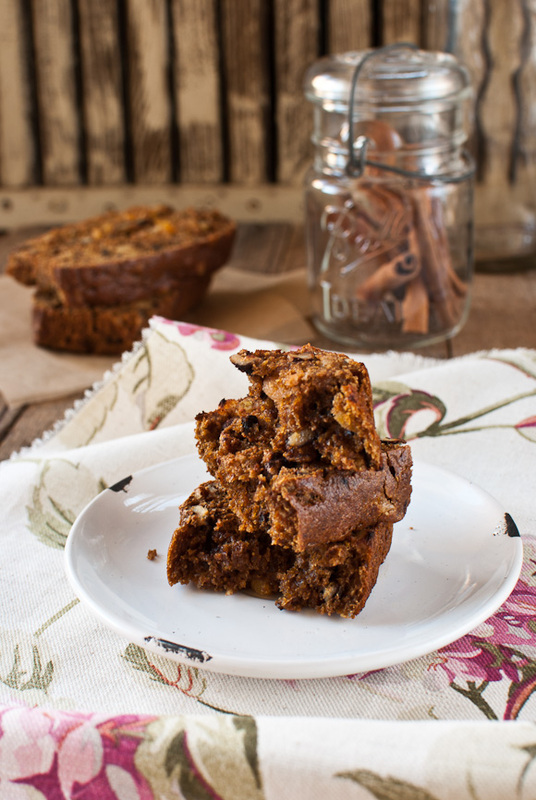 I love how it's not too sweet, it has a lovely hum from all the spices, and it's so moist. You could perfectly toast this for a special breakfast as well. Have a lovely weekend! 1. Preheat the oven to 180C. Grease a large loaf tin and set the tin on a deep sided baking tray. 2. In a large bowl whisk the eggs, sugar and butter. Sieve in the flour, spices and baking soda and mix thoroughly to combine. 3. Add the rest of the ingredients and stir well to combine. 4. Pour the mixture into the prepared loaf tin. Pour enough warm water into the tray to reach half way through the loaf tin. Bake the bread for about 1 1/4 hours. Take the loaf out of the tray and leave to cool on wire rack before turning onto the rack. Love the combination. Looks gorgeous! Persimmons!! Hmmn never thought persimmons and walnut combination but this got to be good! Tea and this bread will be a nice treat on weekend... Have a great weekend Maria! ive never tried persimmons in bread! usually i just eat it as it is or in a preserved version. looks fantastic! This is a new kind of combination for me and looks so delicious. Looks so lovely, Maria! I'm so eager to try baking with persimmons this fall =). Looks like a lovely dense bread perfect for this winter. I like this bread, sounds really delicious! Have a great weekend! Oh Maria I would adore a slice of this right now, please! :) I am so excited for this weekend. Beautiful recipe. A wonderful bread! So smooth and enjoyable. Another great recipe! We're going camping with friends this weekend, so perhaps I should knock up something like this to take with us - it would be the perfect picnic bread! What great timing seeing this recipe. I was actually looking up persimmon recipes yesterday. Your bread looks so delicious and the perfect comforting thing for these cold winter days. Looks like awesome comfort food on a cold winter day with a nice hot cup of tea. Delicious! Mmm, I love persimmon with cinnamon, cloves and nutmeg! What a curious combination of persimmon and walnuts! I think this looks wonderful. I think I'll have to give this one a try this weekend! Anything with persimmon and walnuts together sounds heavenly! the rich deep color of the cake in itself is enough to try it. Just beautiful! Persimmons are definitely my favorite winter fruit! I can't wait until they're back in season again and when they are, I am SO trying this bread! Mmm this looks like the perfect cold weather bread. We're obviously in the opposite season here in the U.S., so I'm looking forward to some nice summery weather this weekend. But for now, lots of rain! You are inspiring me to bake breads Maria! !I have baked 2 bread loaves in 2 days and planning to bake more this weekend! This is so cool! I love walnut bread and perssimon's sound like such a fantastic addition. This looks delicious! My father is from Finland so I am so excited about your blog...I've been looking for some yummy Finnish recipes. Thank you! I love walnut bread; it is hands down one of my favorite "special" breads. The addition of persimmon looks wonderful! 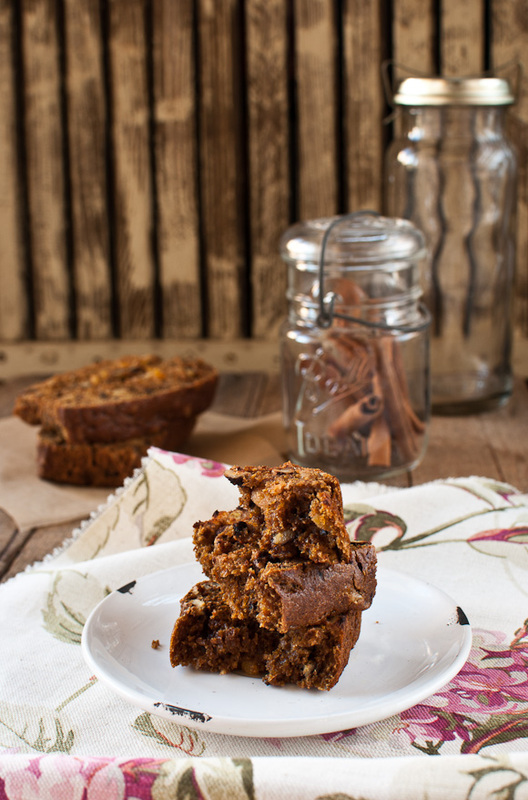 I have never used persimmons in making sweet bread and I would love a taste! Your bread looks so delicious, perfect in the morning with tea I bet! Such a warm and welcoming bread for winter. I would love to toast this and slather it with butter for breakfast! Dark, rich and delicious - another lovely creation! I might have to make this one soon. Love the earthy look of this quick bread. It's loaded with delicious flavours and nutrients. Love how dark the colour is in this bread. I love its colour and "density". Looks like a really great bread. how unique! I've never had persimmon this way, I usually just dry them in the dehydrator and snack on them :) Looking forward to fall here in the States! how fantastic, this reminds me of my grandmother. Such comfort in bread. Great timing, Maria. Just seen six persimmons for £1 and wondering what I could rustle up with them! The sweet persimmon and nutty/bitter walnut is a good combination for the bread. That is a fantastic flavor combination. I can't wait to bake this bread. Is Whole spelt flour different from normal spelt flour. I am so glad that I found your blog Maria. 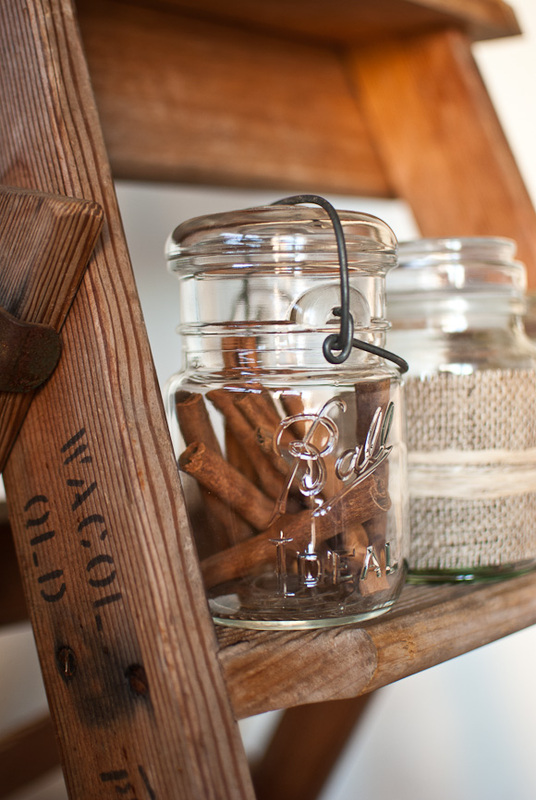 I love your home style Finnish recipes and the rustic and gorgeous looking pictures. Very delicious in look and hope in taste too. Thanks for sharing such nice recipe here.